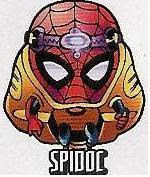 a Spider-Man MODOK*. Or MODOC**, if you prefer. Either way, it's about 38 different varieties of awesome. As is a Wolverine MODOC who can't stab anybody because his arms are too short and stubby. And Karl, the least-effective hench-scientist in AIM*** history. * Mobile Organism Designed Only for Killing.